We have all grown up watching the Tournament of Roses Parade on New Year’s Day. Live from Pasadena, California, we become transfixed to our televisions as the host of flower-festooned fantasies float fearlessly from their starting point on “Orange Grove, making that turn onto Colorado Boulevard.” (I know that phrase must have been trademarked by some parade announcer somewhere…) As in prior years, Disney and Pixar have jumped on the bandwagon with their long-time float partners, Artistic Entertainment Services (AES), to bring the magic of Cars Land to life for the 2013 Tournament of Roses Parade. 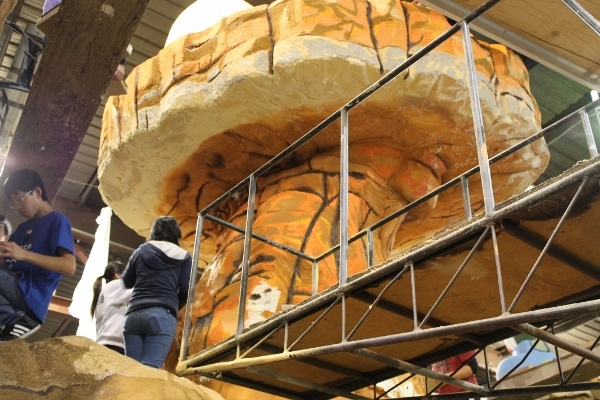 Across the world, people ask how they make such amazing parade floats – covering them with every natural material known to man. In fact, folks that come to Disneyland to celebrate the winter holidays often make the pilgrimage to Pasadena to see the Rose Parade. 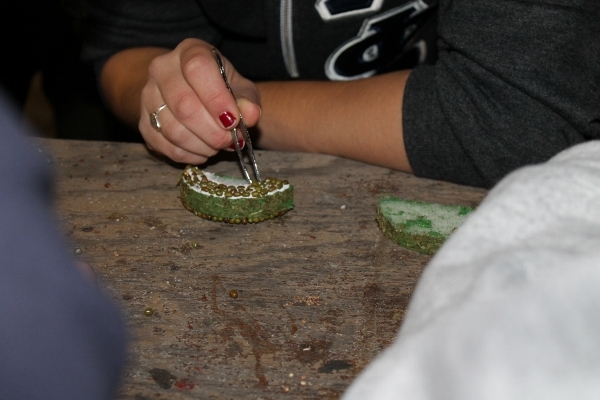 Some even fulfill their dreams and come early enough to be volunteer decorators at the float houses. That’s something I’ve done in the past (as I’ve mentioned on several of our shows) and, with Disney’s invitation, I’d like to show you what it’s like to be in the middle of this bustling event, details of Disney’s float, how hundreds of volunteers help to bring it to life, and how you, the Disney fan, can be a part of future Rose Parades! 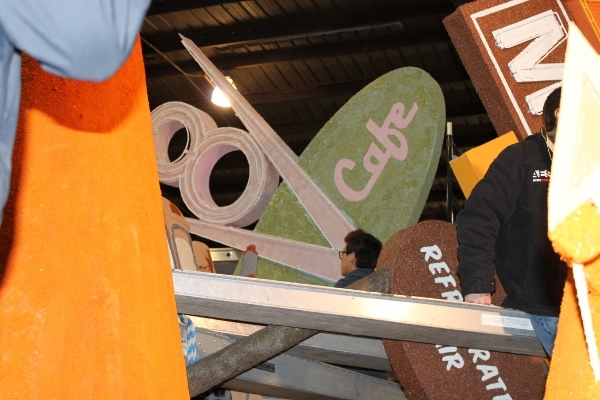 This weekend, I joined many Rose Parade volunteers, and Disney fans, and even Cast Members in the heat of what seasoned float decorators call “Deco Week”, as they worked to bring Disney’s Destination: Cars Land float to life. On hand to show us the process were Randy Wojcik – Senior Show Director, Disney Creative Entertainment Bradley Kaye – Senior Designer, Disney Creative Entertainment, CEO Craig Bugajski and Floral Specialist/Volunteer Recruiter Andrea Zepeda from Artistic Entertainment Services, and outgoing Disneyland Ambassador, Rene Torrico. 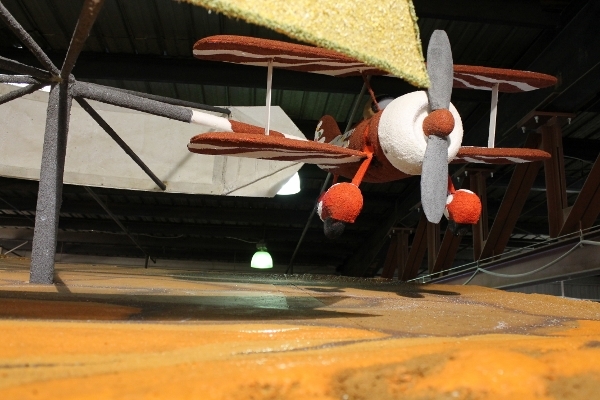 When workers enter the “float barn”, one of the things displayed prominently is the concept drawing for the float. It’s the point in which all float development begins. In this case, Disney/Pixar creates the initial vision, AES provides their mechanical and technical feedback, and then the two teams take that information to develop the final design. Pixar then oversees things so that the art styling and characters retain their integrity throughout the construction process. 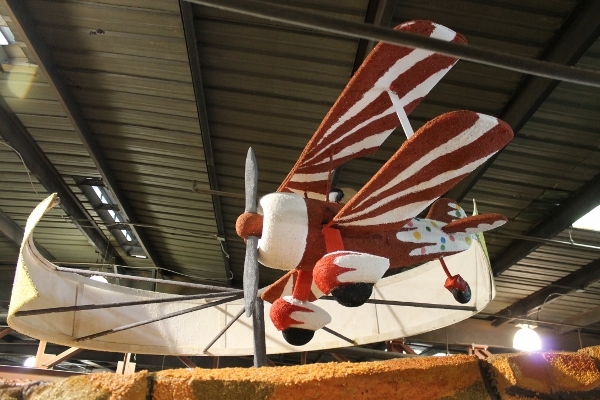 Since AES has worked with Disney on previous projects, such as the Soundsational Parade floats, they are quite used to maintaining the company’s standards. 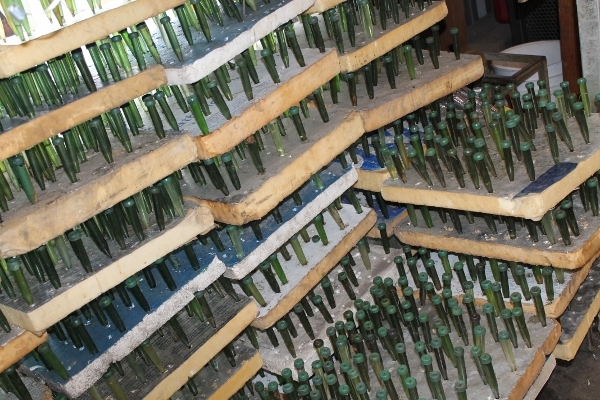 Once everything is in place with the structural design, the floral planning begins. This means that the folks at AES need to figure out what floral and plant materials will match and express the colors in the design. 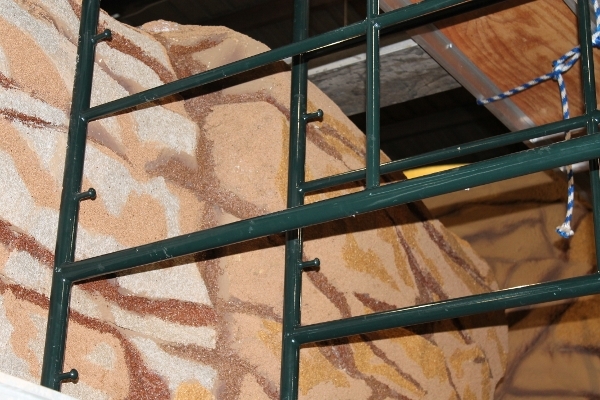 According to Tournament of Roses rules, every visible surface of the float must be covered with natural materials, such as seeds, dried and fresh flowers, and live plants and leaves. 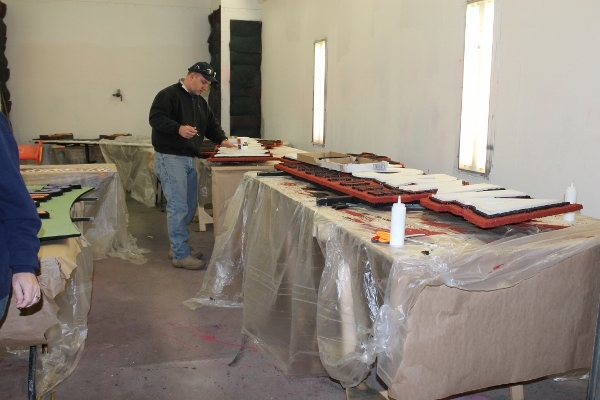 Throughout the year, floats are welded, covered, and painted like a Paint-by-Number project. dried petals of statice and strawflower are ground to fine bits, and new application techniques and challenges are tested. 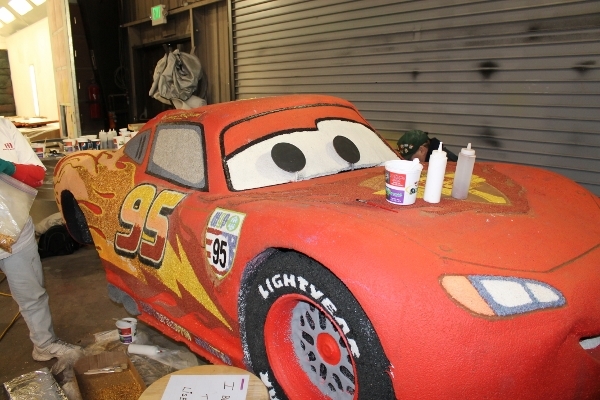 For instance, powder made from ground grapeseed will act as the outline material for Lightning McQueen’s fine detail outlining. 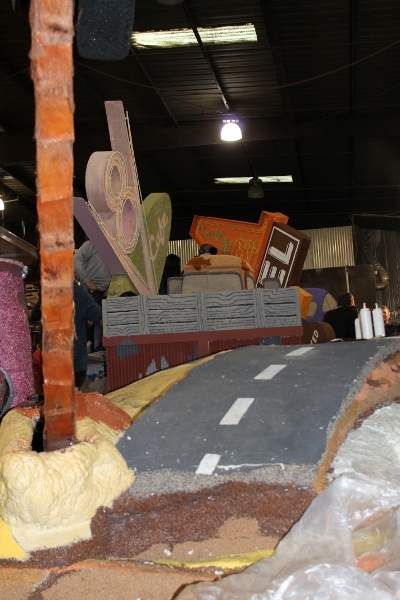 There will be dozens of different dried materials on Disney’s float from . 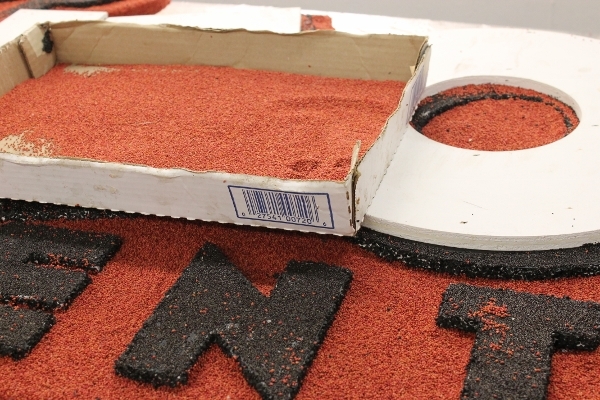 Cranberry seeds make a solid red, while onion and poppy seed make black pop. 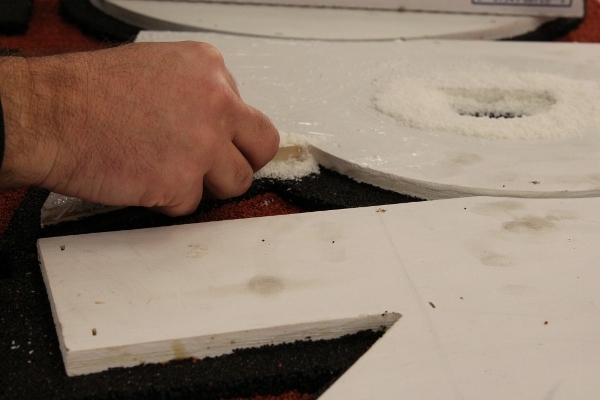 One color is applied and the glue dried before another is begun, so that the materials don’t mix. 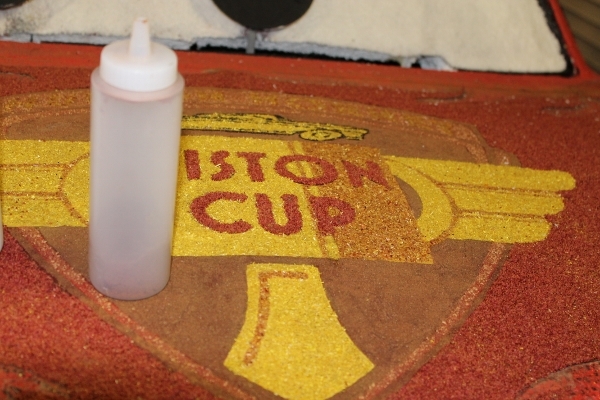 which will be either glued directly onto the float – as in the case of carnations, or are placed into the thousands of waiting vials that are stuck into holes in the float surface. This is a fairly painstaking job, requiring a lot of manpower to do the job in the two days preceding the parade. 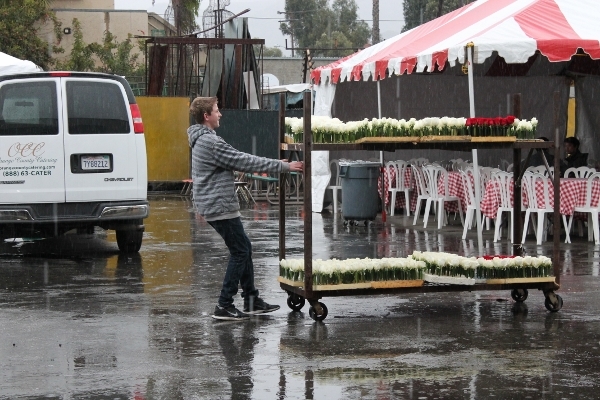 As the roses are vialed, they are taken to the staging area for use. According to Andrea, they will be using 3 colors of roses (red, yellow, and orange) on the base of the Cars Land floats, as well as pink carnations. 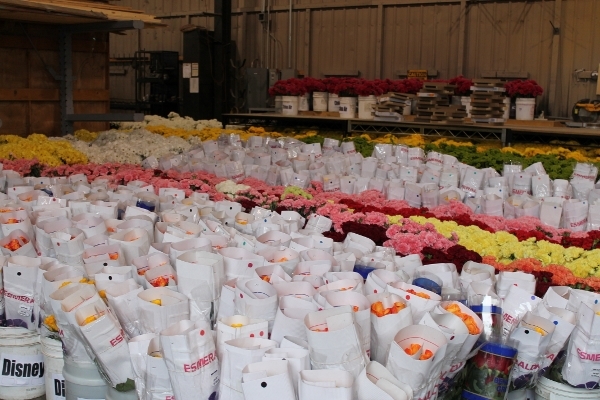 The flower staging area is home to all the needed supplies and is relatively quiet, compared to the main work area of the barn. 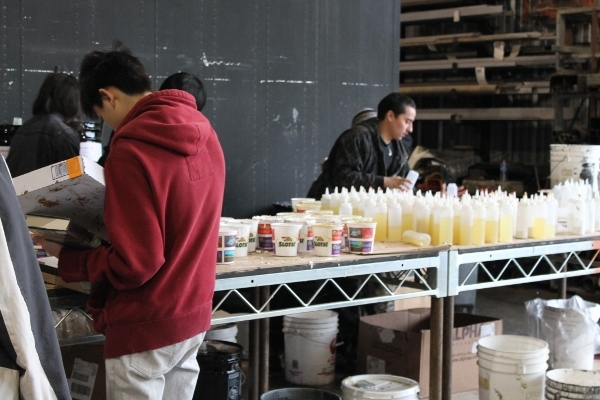 Two kinds of glue (Elmer’s and Oasis Floral glue) and brushes are dispensed and cleaned. 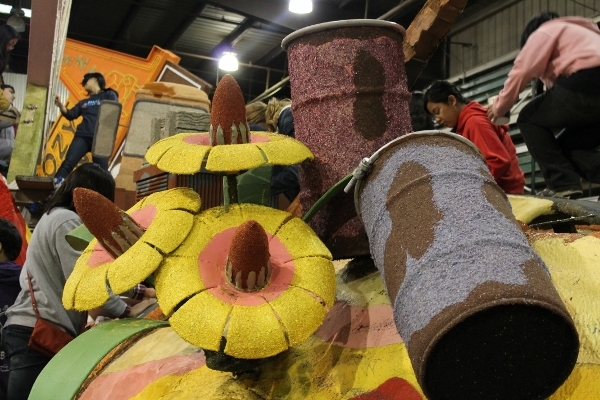 Glue containers are sorted and cleaned, if they have become “contaminated” with seeds and petals – a rather messy, but necessary task since contamination can ruin the colors and cause the floats to be marked down during judging. Once you are given your supplies and tools from your foreman, you enter the barn. 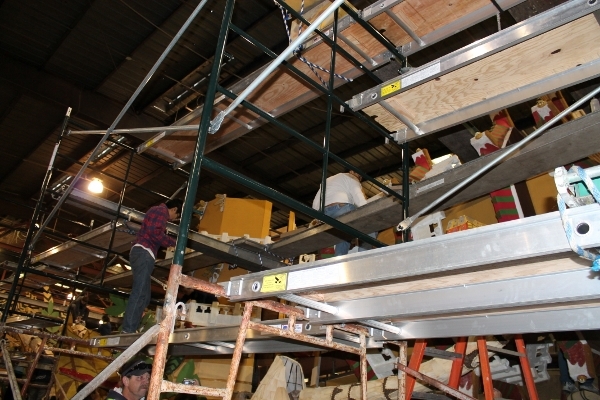 Scaffolding is the main decor and surrounds the float. AES doesn’t allow anyone under the age of 13 to climb the scaffolding and there are strict rules to follow. Float decorating is definitely a way to cure your fear of heights – something I know from experience. As with anything Disney does, Destination: Cars Land is full of details, and this overhead view, familiar to those who love the HGTV float construction webcams, is a great view to introduce us to those details. 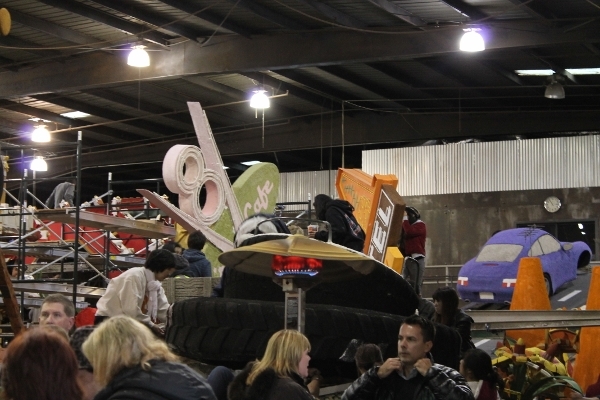 AES has the room to house up to 6 floats in their barn. 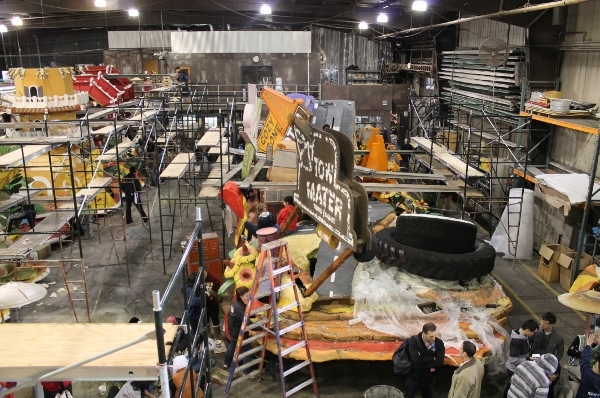 Disney’s float is actually comprised of two standard-sized floats, so you can tell from the photo that it took up quite a chunk of the barn. The overhead view shows the front half, from the perspective of where it joins the back half. Here’s a different perspective. 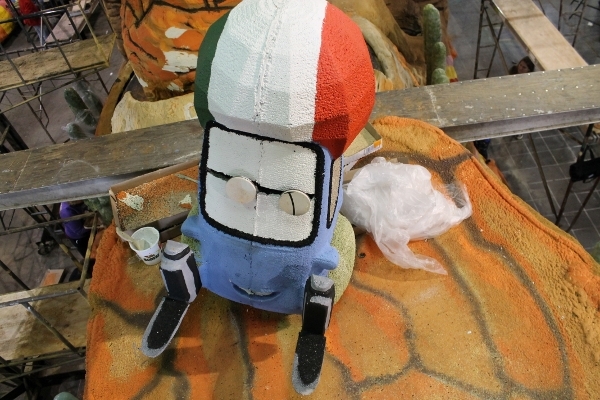 Sally, covered in statice, has already been placed on the nose of the float, with Lightning to join her after he receives his final detailing. They will both be animated, as if starting to race. From the rear of part 1, you can see that the road is supposed to lead directly through Radiator Springs, just as it does in California Adventure. The famous neon signs of the local establishments are actually collapsed for easier decorating. Once raised, they’ll be spinning to the soundtrack! All three of the Cars Land attractions are featured on the float in their respective locations along Route 66, the front unit featuring two. 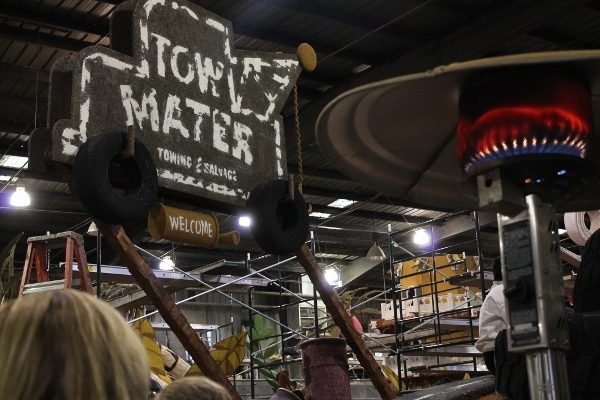 Baby tractors represent Mater’s Junkyard Jamboree. These animated little guys will be tipping and steaming their way down the parade route. 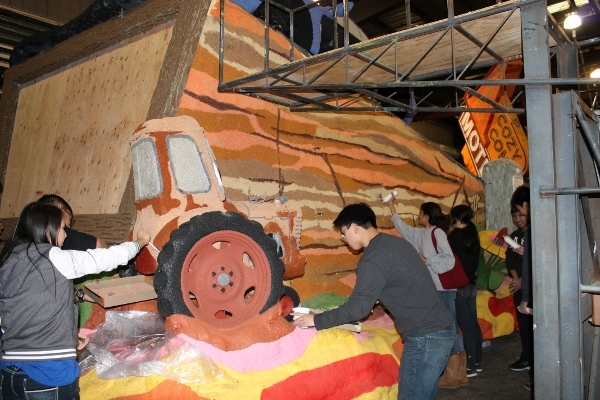 At the middle of the float, you’ll see Mater’s trademark sign decorated with black onion seed, poppy seed, and coconut. Notice that outdoor heater aflame in the photo? Propane heaters are found throughout the barn for warming your hands and bodies while working on the floats. Volunteers who participate are encouraged to wear clothes that you won’t mind having a bit of souvenir glue on, but that will keep you warm in the cool and possibly rainy December weather. You can tell the regulars – they wear a utility jumpsuit or other such clothing that they reserve especially for this. The AES employees are distinguished by their navy logo wear, so you can always tell who a foreman is. 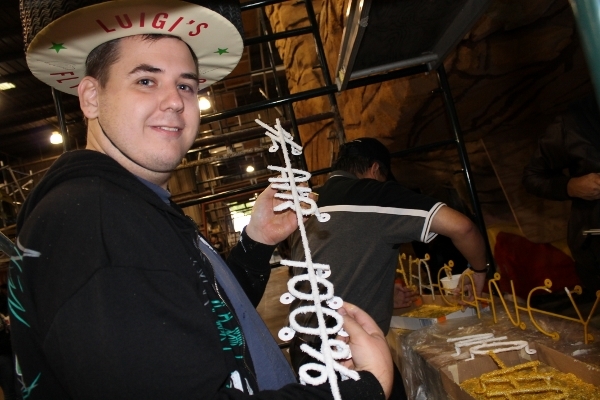 Near Mater’s sign, you’ll find the second attraction – Luigi’s Flying Tires. 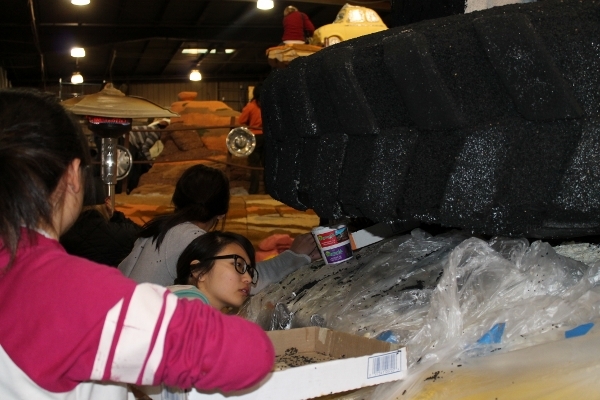 Local high school students are required to have a certain amount of community volunteer hours under their belts each year, so you’ll find many that become pros at challenging jobs like gluing the larger sized onion seeds to the underside of a large tire. As you can see, plastic is draped over the body of the float so the glue and seed used on the underside of the tire won’t drip onto lower surfaces and be stuck there to contaminate the surface cover. 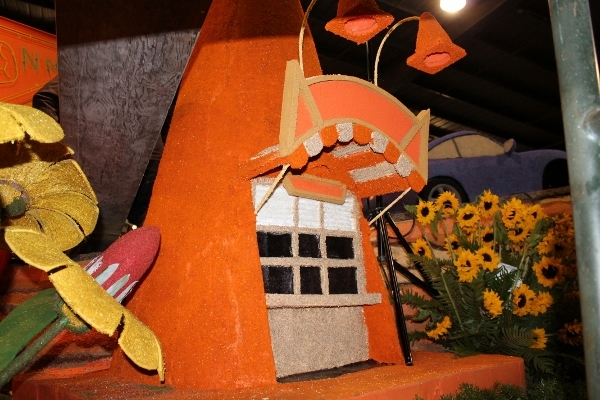 The final area of the front float that had already been completed in coconut, orange lentil, and marigold petals is the Cozy Cone Motel. 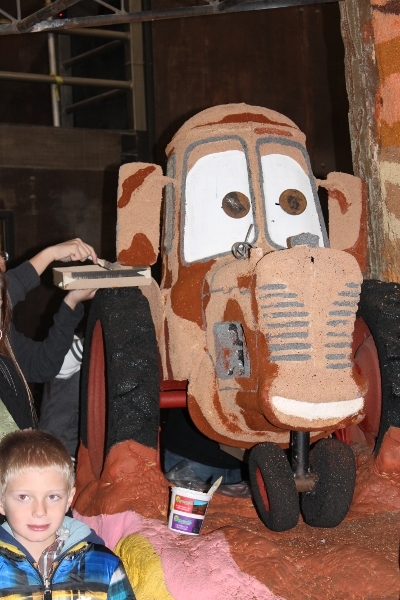 I absolutely love this part of Cars Land, and this part of the float was no exception. From the food service windows right down to matching the cone flowers, the detailing of these structures was fabulous. 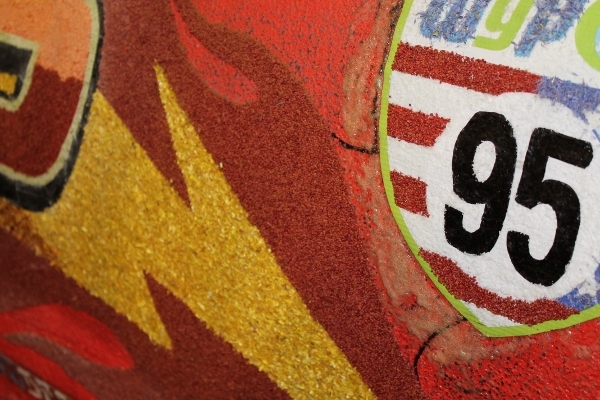 Now, you may notice, we saw Sally, but where was Lightning? The answer is that he had his own special area of the barn, just for his own detail work. 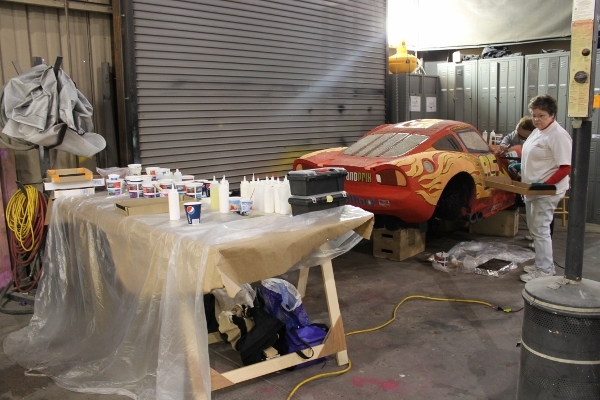 Here, a very special team of seasoned volunteers works to make sure Lightning and all of his famous detailing are applied so meticulously that even Ramone would be proud. Notice how he’s only partially completed, with his red cranberry seeds, yellow strawflower, blue statice, macaroon coconut, and black onion seed? His day will come tonight, when they will start putting the red carnation petals on his surface, gluing them one at a time. It’s tedious work, but the results will be amazing when it’s done. Signage and special details are actually done in a clean room. They’ll be protected between sectional colors by plastic sheeting. A team of Disneyland Information Services folks were here, gluing macaroon coconut onto the California signs, using such tools as Popsicle sticks to press the material into the glue on the sides of the letters. Cast members and their families can sign up to work via the Disney Voluntears group. 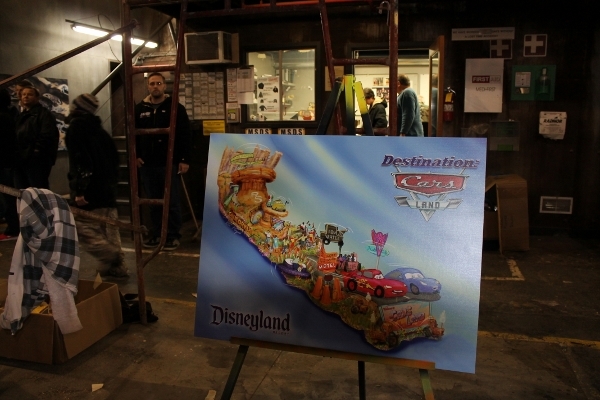 Moving to the back half of the float, we finally move into our final attraction, Radiator Springs Racers. 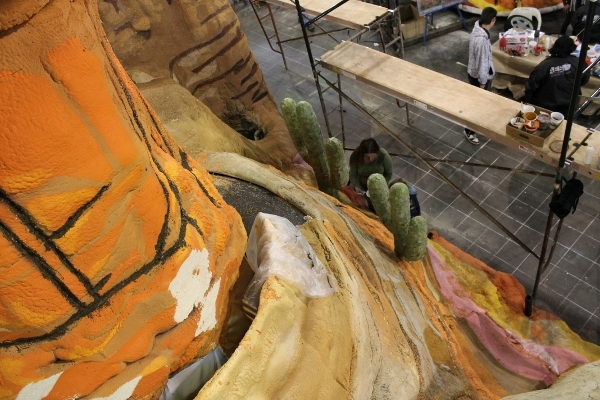 This portion of the float will have the most kinetic movement of all – despite all of its massive rockwork, which isn’t easy to create. The front of this section will showcase a stage, where some of Cars Land’s talented dancers will perform before the burbling Radiator Spring! 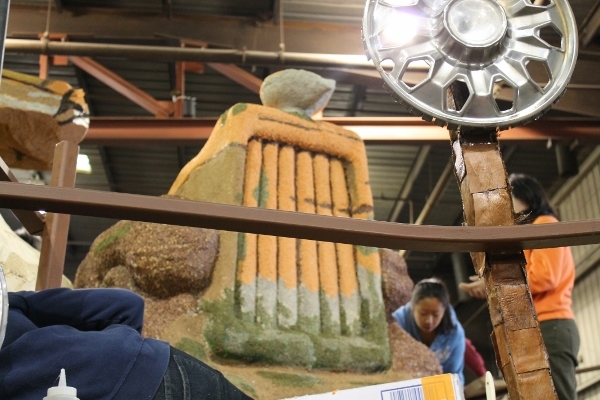 This will be one of 4 active waterfalls on the float. Behind the stage is all of that glorious rockwork. You can actually see it in three stages of completion in the photos. The color striations are realized with the use of ground lentil and dark brown flax seed in the crevices. and above. See those cacti down there? Those are covered with silver dollar eucalyptus and have thorns made from cardoon puffs. 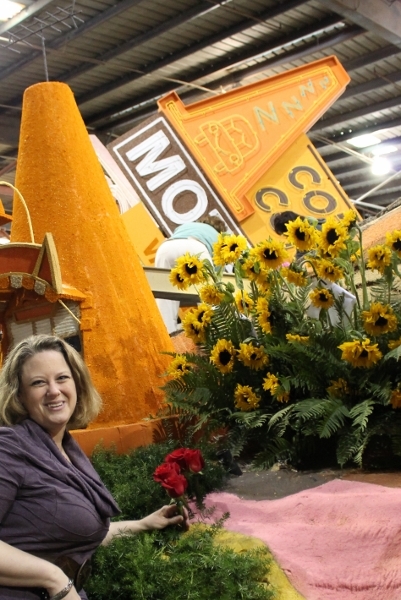 They’ll be joining a host of over two dozen varieties of live cacti, which Andrea told me would be the largest amount ever showcased on a Rose Parade float! and dried seed and flowers to the exterior. 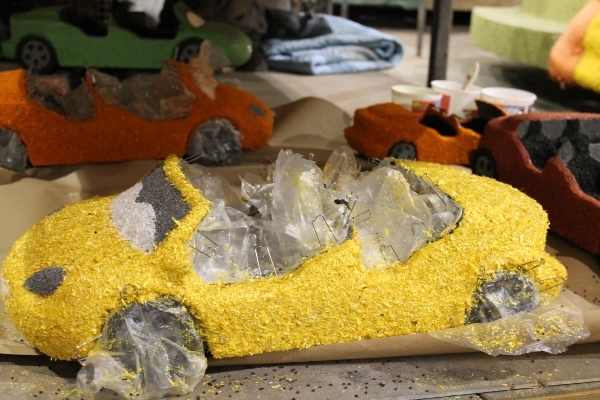 Notice how the interior and wheels receive a protective covering to keep the yellow strawflower from polluting the black seeds. Along with my favorite, Guido, they’ll also be receiving eyes made from seaweed. Notice that they still need to complete the rock surface under him, too. You can really see the color effect guide in this photo. Once again, plastic sheets protect these guys from the orange lentil and flax in the rockwork. Out of the entire float, the thing I felt was most exciting was their “Easter Egg” (a popular phrase for a hidden reference in movies and television that is almost regarded as a nod to a future or past project or trivia bit). Barney Stormin appears at the top of the butte, flying a banner with the Disney slogan for the summer of 2012 – The Happiest Place …) You know the one. When you get up to the top and get a closer look, he’s adorable! Who is Barney? If you don’t remember him from Cars, it might be a hint that planes could take the world by storm in Disney Toon Studio’s upcoming movie, Planes. Ironic, huh? I have to admit – this is a great feature for the fans that are sitting in the higher bleachers along the parade route. For those folks sitting curbside – no worries. 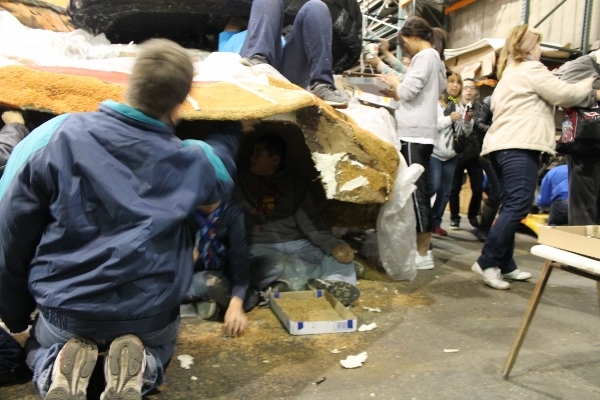 Today, a cub scout troop applied seed to all the wheel wells, so that you won’t see any uncovered areas. 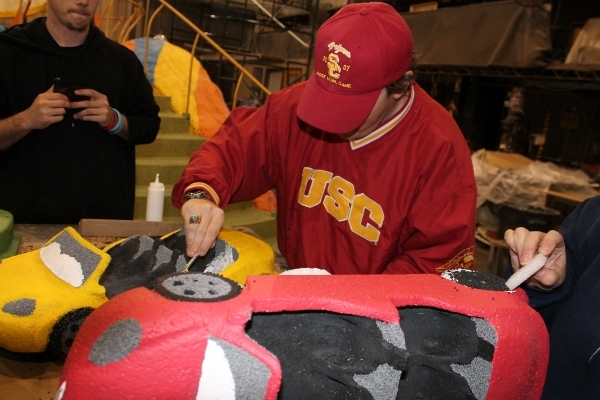 Being in the barn made me miss my float building days with the Burbank Tournament of Roses group. I had to do the traditional “Media Person Places a Rose and Takes a Souvenir Photo” thing. If you’d like more information on planning an add-on for your Disneyland vacation to include viewing the Rose Parade, you’ll want to visit their official website, as well as Sharp Seating for reserved bleacher seats and parking. My favorite thing to do? Visit Orange Grove Boulevard for New Year’s Eve. All floats must be parked in their spots on Orange Grove by 12am midnight on December 31, to qualify for the final judging. 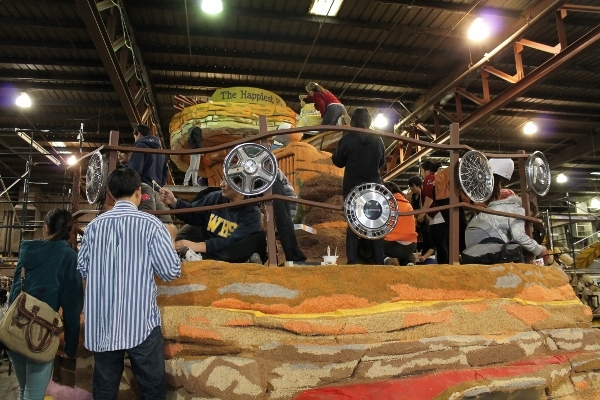 It’s a great time to see the floats, fresh out of the barn! Just watch where you park!